The topic of data protection looks as dry as dust in some of the syllabuses I’ve seen. They tend to focus on the legislative aspects, which in my opinion should be dealt with last of all. I always carry a camera around with me – as well as my phone. Why? Because you never know when you might see something interesting enough to use as a stimulus for an article. And why both? Because each one gives better results in different lighting conditions. Interestingly, my camera, which boasts a Leica lens, copes less well than my phone in the dark – which is why I used my camera for the night street scenes shown here. I like the slightly out-of-focus effect, and the fact that in one of them the darkness is almost overwhelming. I think if you teach you should encourage your students to always carry a camera of some description with them at all times. And if you are a Head of Department, encourage your staff to do the same. Here are my reasons. In this article, English, Economics, culture, geography and tourism are highlighted. Like most of the pictures I take, this one was unplanned. I saw all these boats in the evening, as I crossed over the bridge in York town centre. The scene struck me as rather poignant. In this series I'm looking at how well-chosen digital photos can be used in different areas of the curriculum. Today I'm looking a some photos that might have sparked off an historical investigation if I'd had more time. In this series I'm looking at how well-chosen digital photos can be used in different areas of the curriculum. In the first one, I looked at the problem of litter. This one, however, is about a much more pleasant subject: a local artist. I visited a beach in Suffolk recently, and came across someone painting the landscape. It was a great occasion to have my camera with me! So who was it? Read on to find out, and to consider some possible curriculum links. In this series I'm looking at how well-chosen digital photos can be used in different areas of the curriculum. In this article, the focus is on Environmental Studies, bringing in aspects of health and safety, Media Studies and others. You could clearly use this picture to inspire some creative writing in English. But could you also use it any of the following contexts? And if so, how? Digital cameras have been with us now for well over a decade. But three things have changed in that time. Firstly, you get a bigger bang for your buck, in terms of image size and quality. Secondly, cameras on mobile phones have become good enough to mean that people can now dispense with the camera as their means of taking pictures. I quite like this picture of a street near the Barbican, London, at night, mainly because it has that three o'clock in the morning feel to it. All that's missing is a newspaper billowing down the street and the sound of a lone saxophone. I’m a firm believer in helping youngsters (and colleagues) to become as self-sufficient as possible. As well as being healthy, in my opinion, it is also a requirement of some examination courses. Here’s a photo that was taken circa 1990. It shows a history lesson in progress, in one of the computer rooms. This is the sort of lesson I really like. As you can tell from looking at the picture, which was unposed, all the kids are fully engaged. The history teacher can be seen to the left of the photo, almost out of shot – literally a guide on the side. The topic, as you may have gathered, is the assassination of President John F. Kennedy, and the students, who were 14 at the time, were using a variety of sources, both digital and paper. I’ve annotated the photo with letters. Here’s what they indicate. B Two girls collaborating on researching a database. C Girl making notes on her findings, on paper, for use in a presentation later. D Screenshots from the JFK database showing photos that were taken at the time. E You can’t see it very well, but that’s a box of printer paper for use in a dot matrix printer. The paper was a ream of pages joined up and perforated, like toilet paper, with sprocket holes down the sides. H Newspapers, just one of several types of resources we used in the lesson. I It’s not very clear, but that’s a 3.5” so-called “floppy disk”. That one could hold around 740 kilobytes of data. J A monitor. It looks very quaint now, but I’d equipped the room with Atari ST computers. Although mainly associated with games, there was a range of office and educational applications available. All the programs shared common menus, which made it very easy to learn new applications – remember, this was around the time of Windows version 1. The monitors were high definition, with black text on a white background, unlike certain other computers at the time. They were fast too. K As far as I can tell, this is one of only two girls in the entire class who was actually listening to the teacher at the time; well, be fair: they had work to do! If you think I’ve missed some bits which need explaining, please let me know.And please let me know if you find this sort of thing interesting. Geotagging is the term given to the adding of geographical metadata to photos, videos, tweets, websites and other media. This ' metadata ' can include longitude and latitude, and other attributes such as altitude. There's a fuller version of this summary information over at Wikipedia , but let's think about the applications of this technology in school. You can geotag photos, which is a fancy way of saying that you can embed geographical metadata into your digital photos. Have a look at the information -- the metadata - shown below for two photos. One important difference between the two is that the one on the right includes information about where the photo was taken. Another option is to place your photo on a map in Flickr . This works well, but can be a cumbersome process if there are lots pf pictures to process. Obviously, it would be a good idea to make this process an educational activity in itself: something the geography folk could get involved in perhaps? There's a geotagging group on Flickr , with links about how to use the mapping facilities there. Yet another approach is to but a wi-fi-enabled storage card, which is what I hope to experiment with soon. This looks like a brilliant option. It's not exactly cheap, though, and at the moment it seems to me that you'd get better value for money by purchasing a new gps-enabled camera than one of the full-works eye-fi cards, even though it would cost you more. I think this is an area where careful research, and some patience, are required. So what can you actually use geotagging for in education? One obvious answer is anywhere that mapping is relevant. For example, a presentation about a school trip can be made to come alive by placing the photos taken on a map. And school excursions can themselves be made more exciting by the use of geocaching , which is essentially a treasure hunt that makes use of GPS-enabled devices to find hidden objects. Get SmartExploration of different habitats in the local area or school grounds can include geotagging the photos taken. In Scargill Junior School, mentioned earlier, the children use the SmartPhones to take pictures of minibeasts , and the exact location of the insects is recorded at the same time, enabling them to find them easily again, and to place them on a map. Anything involving measures of distance or altitude will not only thrill the geography teacher, but will be welcomed with open arm by the mathematics teachers too. For history teachers, also, the use of geotagging to explore where past battles took place must be an exciting prospect. You could also bring in a discussion of the impact of information technology on society: in England during WW2 rural place names and signposts were taken down so that the Germans would get lost if they managed to land on our shores. (See this set of Yahoo! Answers , especially #3.) How useful would that bluint approach be in this day and age? Even the artists can get involved. You can find out how by going to Lesson Planet , where a multitude of suggestions for geotagging and using GPS-enabled devices will be found. You have to log in to find out the detail, but there are pages of ideas which subject specialists should be able to make sense of. An example of geotagging you may have come across is the Clustr map . Seen on numerous blogs , this is a map showing where visitors have come from. Variations may also be found on widgets which proclaim when the last visitor arrived on the site, and where they are accessing it from, and the sort of thing I experienced when taking part in a Classroom 2.0 Live discussion , when as people joined the discussion they were invited to enter their location on a world map. This kind of thing is, I have to say, terribly exciting! It's fascinating to see how many people in different parts of the world are looking at your stuff. It engenders a sense of curiosity ("What country is that ?" ), and even a sense of responsibility: in some cultures some of the things we say and do would probably cause deep offence. OK, so geotagging is fun, and educational, but where does Web 2.0 come into it? I think there is the obvious answer that the sort of thing I just mentioned msakes it interesting and more meaningful to collaborate with other people from a different location. On a more everyday level, it's possible to take a photo of something, say a restaurant, review the thing you've taken a picture of, and upload both to a site where anyone looking for a restaurant (say) in that area will come across your review and photo. My own view is that geotagging is not so much an example of a Web 2.0 application in itself, but it is certainly one that can enhance what I would call the 'Web 2.0 experience'. Came across this fantabulous article via a tweet by @educatoral. Whilst it's not directly about geotagging as such, it gives you a great idea of the kinds of thing that you can do with Google Maps, thereby taking advantantage of geotagging data and principles. I love the possibility of being able to superimpose a spreadsheet onto a map (#1 in this list). What a brilliant mashup! "Upload your photos and share them with friends and family!" 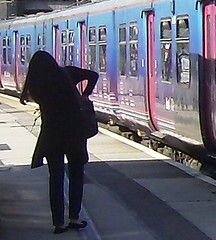 That's how photo-sharing websites such as Flickr are often promoted. But in education, there is a more serious side: photo-sharing sites make available a huge repository of pictures. Pupils like to illustrate their work, but unfortunately all too frequently neither they nor their teachers seem to fully appreciate the concept of copyright. Here's the deal: whoever owns a photo owns the copyright in it. Just because they allow anyone to see it, does not mean they allow anyone to use it. Just because it's available through Google, doesn't mean you're free to use it. Bottom line: if in any doubt whatsoever, assume that you can't use it, and you should be legally safe. Do not be tempted to use something you have no legal right to. Not only might you get caught, it also sets a bad example to your students. So at the very least you must look at the licence terms next to the photo you want to use. If it says 'All rights reserved', it means you can't use it unless you write the owner a very nice email and they take pity on you. Even better, find a photo that is free to use, usually for non-commercial purposes, and as long as you give credit to the owner. My tools of choice are Flickr for the pictures, and the Creative Commons search engine for finding pictures with the right licence terms. When you find a picture you like, if it has the legend "Some rights reserved", click on the text and see what you're allowed -- and not allowed -- to do. You will see something like the Creative Commons licence agreement shown in the illustration. Find out what you're allowed to doRegardless of whether you make use of other people's pictures, I would always encourage schools to create their own repositories. After all, it's highly unlikely that other people will have taken photos of your street, your school or your neighbourhood. And even if they have, they may not be exactly right for your purposes. Flickr is free, or a modest amount for an unlimited amount of space, or you could use a dedicated hard disk or server in-house. Think about it: if each class spent one lesson a term taking photos for the school repository, by the end of the year you'd have hundreds, possibly thousands, of pictures that anyone in the school could use to illustrate their work. You can even build in curriculum work. Depending on your subject and students' age group, have a session taking photos on the theme of shapes, or the colour green, or weather, or ... well, you get the picture. If you do use Flickr, there are 3rd party applications which allow you to do more with your photos than simply share them with others. For example, you can create mosaics, or posters, or magazine covers. One of my favourites is Flickr Toys. If you like the idea of making more use of photos, you know what to do: start snapping! My photos on Flickr may be found here. Let's face it: clip art is, generally speaking, boring. And the reason is not hard to fathom: if a popular program comes with clip art all ready to use with no extra payment needed, then people who are in a hurry are going to use it. The question is: should we not encourage children in schools to look beyond the standard fare? The answer is a cautious "yes". Why cautious? Because one of the things we should be teaching children is that there's no point in reinventing wheels just for the sake of it. If a piece of clip art is just right for the purpose, then why not use it? The problem is, many teachers seem to go no further than telling kids where the clip art menu item is. In the words of the standard school report, they could do better. One way is to create their own photographic clip art with a digital camera. Storage is no longer a problem if a class Flickr account is opened: it's free. What's more, there are thousands of photos on Flickr which have been uploaded by other users, many of which can be used free of charge under certain conditions. Most of these pictures are as unique as the people who took them. There is another outcome of going around taking photos: you start to notice things more. Here's an example: when I went around taking pictures according to a theme of "numbers", I noticed for the first time ever that London buses have *three* numbers: the licence plate or registration number, the bus number itself, of course, and also, inexplicably, another number displayed in the driver's windscreen. That outing also made me start to notice that some shops advertise goods at 50% off while others advertise goods at half price. Does that make a difference to people's perceptions? I have no idea, but I do know that once I'd got going I started to notice numbers all over the place -- and I noticed even more numbers in some of the pictures when I looked at them afterwards on my computer screen. What better way to fire up a young person's interest in numbers and in their environment? One venture of mine was to take pictures of patterns in the street: it's astonishing what you notice once you really look. Some are very nice indeed. And there would have been even more of them had I remembered to charge up the camera battery and the spare battery before leaving home! You can see all the photos I've referred to, and more, by going to www.flickr.com/photos/terryfreedman. Uploading photos in this way paves the way for sharing. For example, if I see a photo of yours that I like, and which I think will fit perfectly with the theme of my story, I will be able to use it as long as the licence assigned to it allows me to do so. The licence terms are clearly stated by the side of the photo. If it says 'All rights reserved', I'm not allowed to use it. But if it says I can use it as long as I give an attribution to the owner, that's fine. Nancy White has provided a useful review of a couple of online applications to help find photos with what is called a Creative Commons licence. A nice side effect of all this, of course, is that it gets across the point that you can't just go around taking stuff you like from the internet: at the very least you have to give credit to the originator. If you don't, it's rude to say the least. And if you use an image for which you don't have permission at all, it's theft. Sharing isn't the same as collaboration, which involves more interaction. There are several ways in which people can collaborate on Flickr, or with Flickr, using various options ranging from joining a Flickr group to annotating photos to manipulating them with a number of 3rd party tools. I intend to write about some of these but in the meantime you might like to check out The Great Flickr Tools Collection. You can use the photos as a starting point for discussion or creative writing. For example, you could incorpoarte a picture into a mindmap, as I have done on my Big Freeze example (shown below as well), and take it from there. Before closing this article, a few words of caution about using Flickr, some of which apply generally. It's good practice to tag photos, and discussing with children the most appropriate words and phrases to use is a worthwhile exercise. Part of the information & communication technology (ICT) curriculum in the UK is concerned with finding things out, so pupils need to know that the use of appropriate tags makes this process a whole lot easier. You will need to exercise the same sort of attention to what pupils search for as you would for any internet search. Although I haven't found anything explicitly pornographic on Flickr, there are pictures with ample amounts of flesh on display. I'm not sure if they would be blocked by an ordinary filtering system. Remember that people own the copyright in their pictures, so you can't use them without permission. Flickr makes available 6 different kinds of copyright licence and explains what each one means in terms of what people can do with the photos. It might not be a bad idea to put a summary of these on your classroom wall or on the school intranet or home page. Children should be encouraged to check to see what, if any, licence has been assigned to the photos they wish to use -- and to ask the owner's permission if none has been assigned (or ask you to do that for them, to prevent their identity being revealed). By the same token, you should decide what rights you're going to assign to th class photos you upload to Flickr -- what a great opportunity for a class discussion followed by a democratic decision! You can't take pictures of people and post them on the web without their permission -- at least, that's the position in the UK. However, I understand from a talk I attended at a recent Society of Authors event that you don't have to worry if the people were not the subject of the photo, such as if you were taking pictures at a fottball match. But I'm not a legal expert, so if in doubt seek advice, or err on the side of caution (see the next point too). You will also, obviously, need to ensure that photos of children are not published without their parents' permission, and to make sure that the children cannot be identified individually: see the UK's Information Commissioner's advice on taking photographs in schools, or UNESCO's guidance for broadcasters. (Thanks to Neil Adam for disocvering the latter whilst researching an article for Becta's TechNews. I'd also recommend going a step further and not taking photos that easily identify businesses or which feature car registration or other identifying details. Perhaps I'm being unduly cautious, but it seems to me that we should at least be encouraging pupils to consider the rights of other people. I for one would certainly not like my car or house details plastered all over the internet, and would feel pretty aggrieved if I discovered that someone had done so. But notwithstanding those few caveats, digital photography is a great way of creating clip art, and for making the environment come alive and helping children to seen new things -- or new aspects of old things. And Flickr (and similar tools) help take it all a step further by encouraging and facilitating the cross-fertisliastion of ideas, and collaboration. That has to be a good thing! I went to Be Funky. I took a snapshot of myself with my webcam (although I could have uploaded a photo instead had I wished to). Once the photo had been taken I chose one of the Pop Art special effects - but there are loads of other categories I could have selected instead. I saved the completed picture to my desktop. All of this was seamless, but it would be nice if Be Funky had an effects preview window, because it's a bit trial-and-error. But hey, it's free: what am I complaining about? Then I went to Say What?, where I uploaded the picture I'd just saved. Adding speech bubbles was dead easy, thanks to the brief but accurate guidance on the page. Once finished, I saved the picture to my desktop once again, and you're looking at the result. Total time? Maybe 10 minutes at the most. I wanted to write something -- anything -- and illustrate it with a Roy Lichtenstein-like drawing. 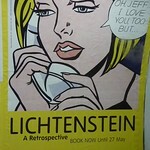 Obviously I couldn't simply use one of Lichtenstein's paintings without probably either landing myself in court or paying a fortune in licence fees. I needed an alternative. Drawing an original cartoon was out of the question. I can draw cartoon faces, but I don't have the patience to paint in all the dots that give Lichtenstein's paintings that printed comic book effect. (He actually painted scenes from comic books.) I needed a program to do the work for me. Searching for something like "free online cartoon-making program" led me to Be Funky. Subsequently, searching for "free speech bubble program" steered me towards the Say What? application. In other words, the two applications helped me solve the problem of: "How can I illustrate my article with a comic-style picture without spending all night on it or ending up bankrupt?" That is why I think these two applications belong especially in the toolkit of the literacy staff in schools, as well as the more obvious places such as Art and ICT.